We’re in the midst of learning to make a pillow sham.Click HERE to view Part I of the tutorial. 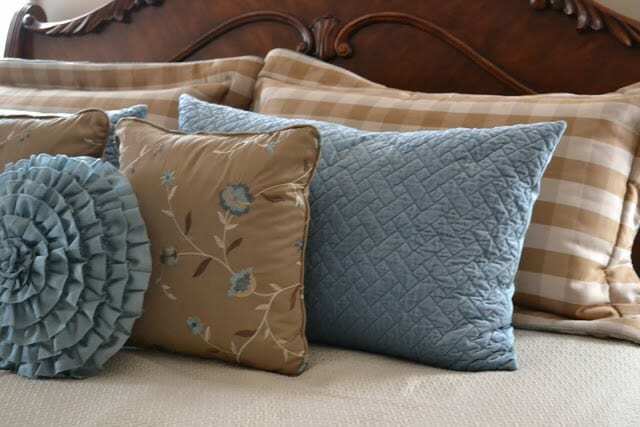 I made two of them to go in the group of pillows on the bed in my master bedroom. Only a leeetle bit more to go. In Part 1, we cut and assembled the front and applied the cording. Here in Part 2, we’ll cover the cutting and assembly of the back and the final assembly of the sham. I only used one fabric for the back of the sham. Batting is only needed for the front and since this is just for me, I chose not to line the back. I would certainly line it if I were making it for someone else though. You need to cut two pieces of equal size for the back. 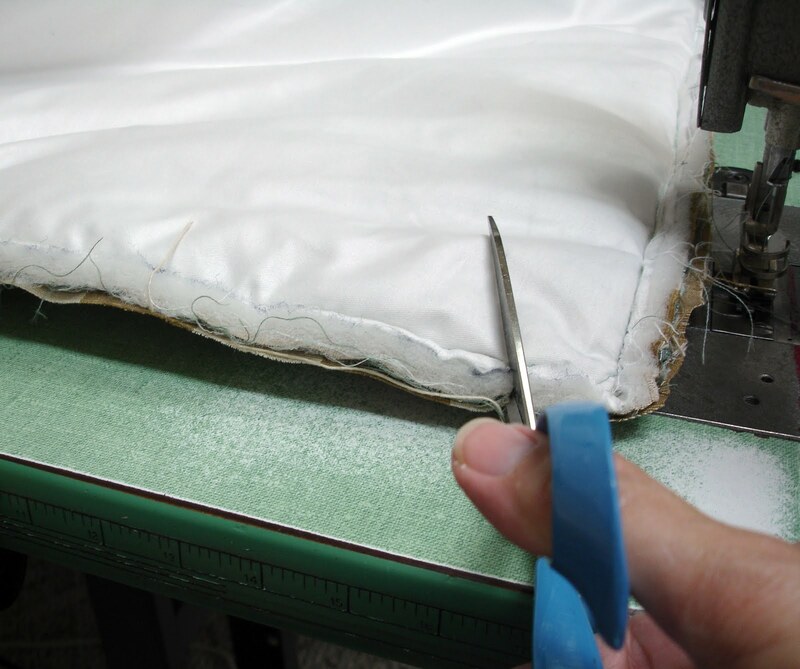 Three inches will be added to the width of each piece to allow for hemming the sides of the opening where the pillow will be inserted. The height of each piece will be the same as the piece cut for the front. Divide the width of the piece cut for the front, which is 43″, by 2 = 21.5″. 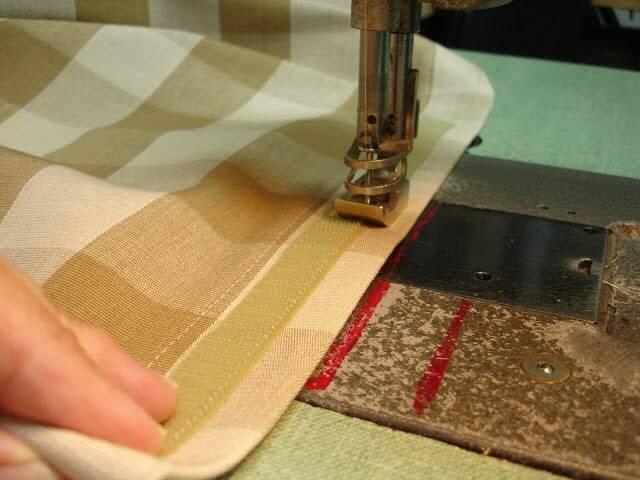 Add 3″ to allow for hemming what will become the opening where the pillow will be inserted. The height will be the same as the piece cut for the front, which is 34″. So – that calculates that each of the two pieces for the back are to be cut at 24.5″ wide x 34″ high. 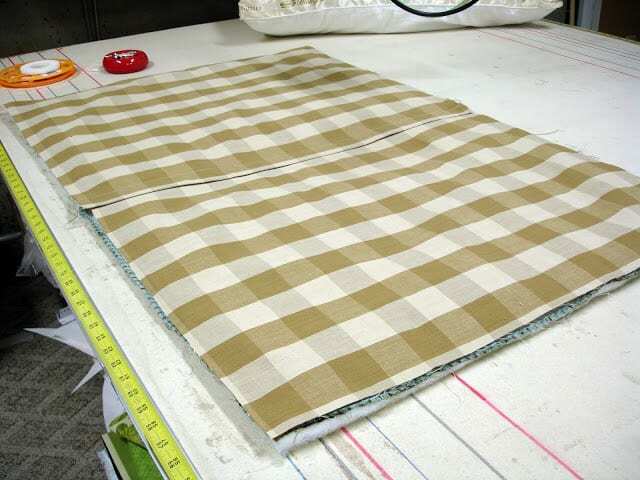 After cutting, the next step is to double fold, press and then sew a 1.5″ hem on one of the 34″ high sides for each of the two pieces. 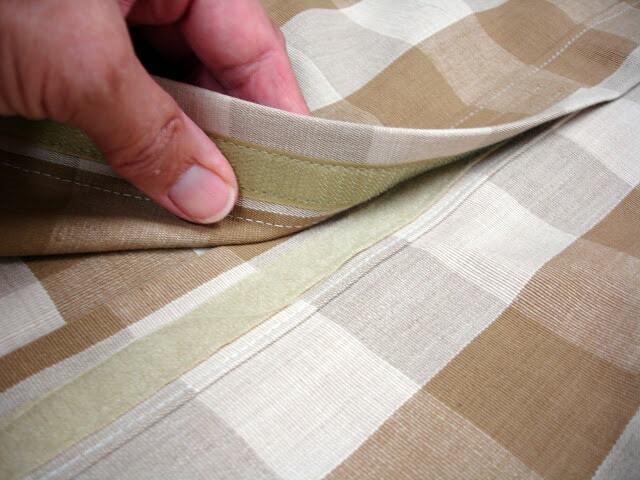 I don’t like the way pillow shams are prone to gap open in the back, so I use velcro to keep it closed. Do not use velcro that is sticky on the back. It will gum up your needle when you try to sew it (ask me how I know). 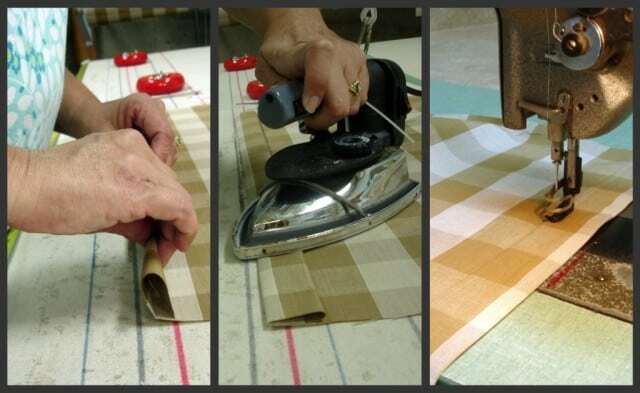 Cut a piece of velcro 12″ long, pull it apart and sew the loopy gripper side to one of the areas that you just hemmed and sew the soft non-gripper side to other. Position the velcro so that it is about halfway between what will become the top and bottom sides of the sham. Tip – make sure that you line your two pieces of velcro up before you sew them to the fabric. The back of the sham will not lay properly if the two sides of velcro are not lined up with each other. This is how the velcro will look when it has been sewn in place. Now that both sides of velcro have been attached, go ahead and position them like they will be when the back of the sham is closed and “stick” them together. Now the back is ready to be attached to the front. Sew the two sides together on all four sides. 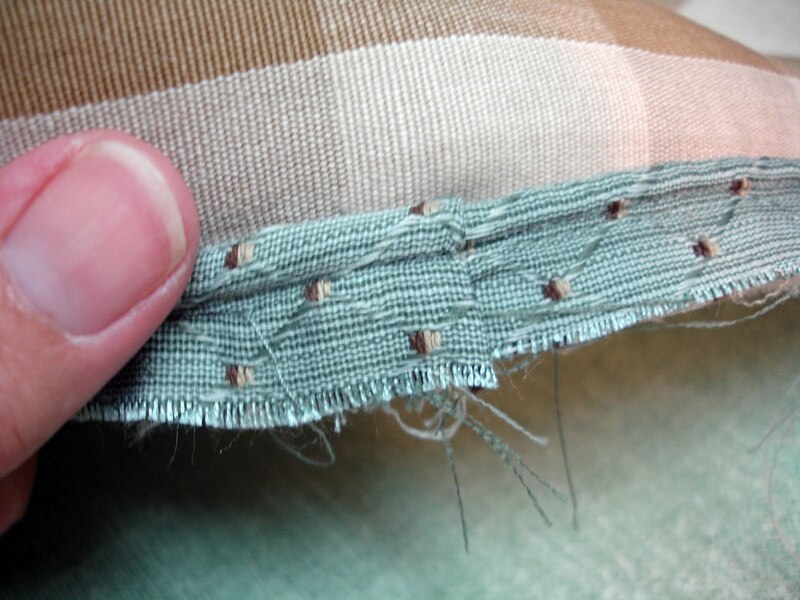 Just make sure you sew as close to the covered cord as possible using either a zipper foot or a cording foot. 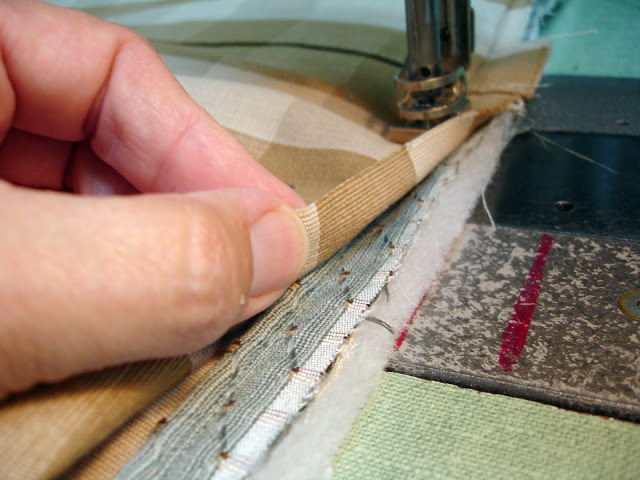 Clip the corners either as you’re sewing along or when you’ve finished sewing all four sides. Be careful not to cut through any of the stitches. When you’ve sewn around all four sides and clipped the corners, turn the sham right side out. Return it to your work surface, making sure it is lying smoothly. You’ll also want to make sure that the covered cording is pushed completely out and not kind of smooshed between the seams. Creating the flange is very simple. 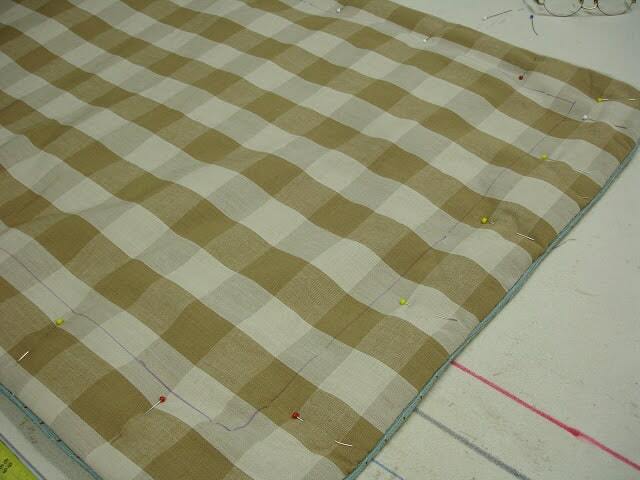 Lay the sewn together sham flat on your work surface. I want to wind up with a 3″ flange on all four sides of the sham, so I measured and marked 3″ in from the edge on all four sides, then used a disappearing ink pen to draw a line around the sham. Disappearing pens can purchased at any fabric store like JoAnn’s or Hancock’s. 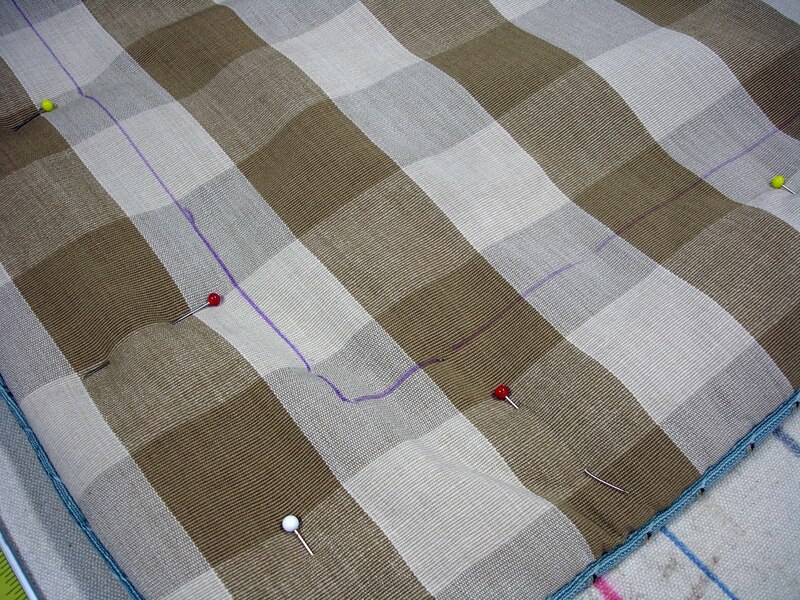 You’re going to stitch on the line that you’ve just drawn so you’ll want to pin all the way around the sham to stabilize the fabric while you’re sewing. Go slowly as you sew so as not to wind up with any puckers. Now…open up the velcro and insert your pillow.Voila! 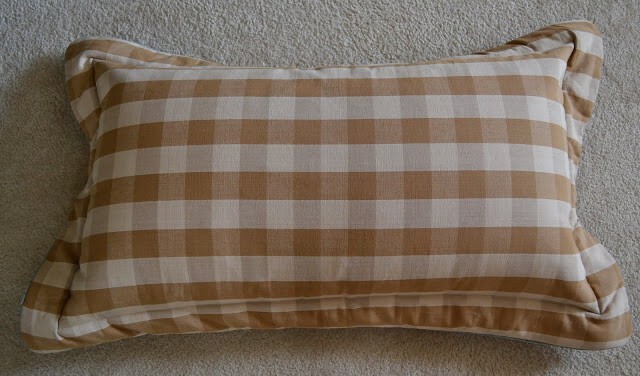 You have a finished pillow sham. Thanks for the tutorial, you are so creative. Wish I could sew. Thanks for sharing with my newbie party. Your love of sewing shows just Beautiful. I also sew but just napkins for my Tablescapes. Im your newest follower on your sweet blog. I hope you come over and follow my Blog. Have a great week and keep cool. I am keeping this post! I am working on 2 bedrooms and they both need new pillow shams. LOVE the fabric. Great step by step. I love your attention to details. I also love that check fabric. Thanks for your sweet encouragement. Wonderful. Thanks you for sharing. It is good to have a professional show us the real way. What a great tutorial. I love the colors and patterns. I used to design for Ethan Allen and Calico Corners. Never did the sewing, but knew it took talent. “how much fabric to buy for each sham.” Thus for 2 standard pillow shams using 54″ fabric with no pattern repeat I would need how many yards?? 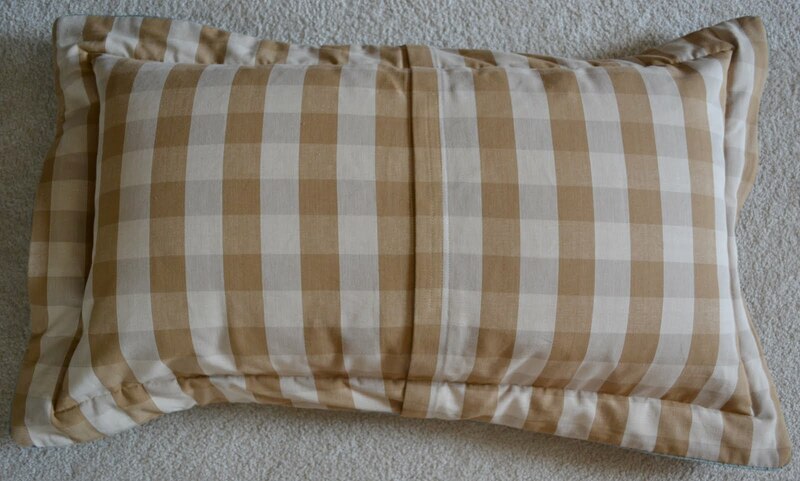 and for 2 king pillow shams with no pattern repeat, 54″ fabric, how many yards. My brain seems to freeze when I work the numbers!!! Also have an accent pillow that is 16 x 24 – how much fabric would I need?? Thanks. I always struggle and second guess myself when it comes to yardage amounts too. Hope the email that I sent to you helped! Wonderful tutorial! Thanks so much!